TradeGecko Payments give you peace of mind by making it easier for you to get paid faster. Say goodbye to lengthy bank transfers and managing multiple payment platforms. Create an account and start accepting payments immediately. See your transactions reflected across TradeGecko and your integrations. TradeGecko invoices come with a Pay Now function. Bill wholesale customers in a single click and offer them an easy payment experience. 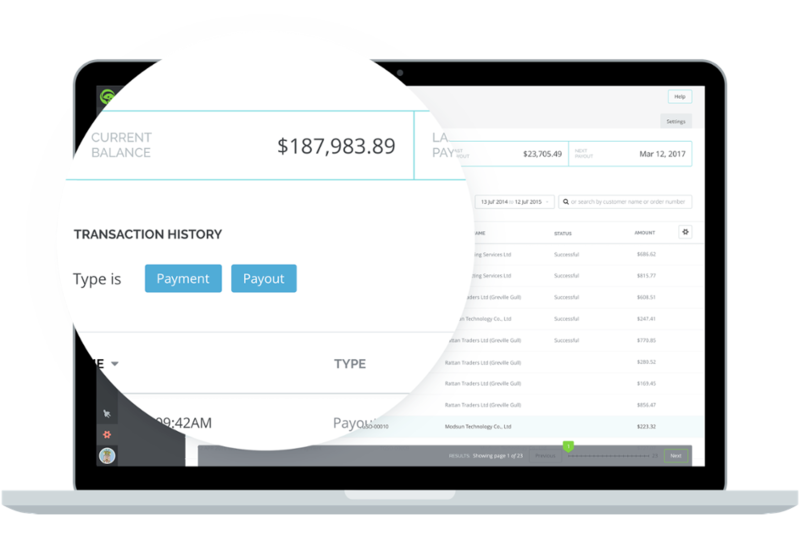 See account balance, payments, and payouts history on a single dashboard. Focus on offering your customers a great customer experience, and let TradeGecko’s B2B payment gateway automate tedious processes. Save time and start growing your business! With TradeGecko Payments, wholesale customers enjoy a streamlined user experience for smoother checkouts. Buyers can now pay for all finalized sales orders and invoices through the “Pay Invoice” button. TradeGecko Payments is a built-in payment platform that helps merchants get paid faster on their wholesale orders. Who is TradeGecko Payments good for? TradeGecko Payments will work best as a B2B payment gateway, as we optimized the system to follow wholesale payments workflows. How secure is TradeGecko Payments? TradeGecko Payments is PCI compliant and uses TLS 1.2 encryption for both transaction and for checkout. What countries does TradeGecko Payments support? TradeGecko Payments is supported in the United States, United Kingdom, Australia, Canada, Singapore and New Zealand. We will start rolling it out to the rest of the world soon, so stay tuned! Can I use TradeGecko Payments to accept payments for B2C transactions? While you can use TradeGecko Payments to accept payment for B2C transactions, it is better suited for wholesalers. With TradeGecko Payments, it is easier for wholesalers and distributors to manage customer relationships and stay in control of payments. 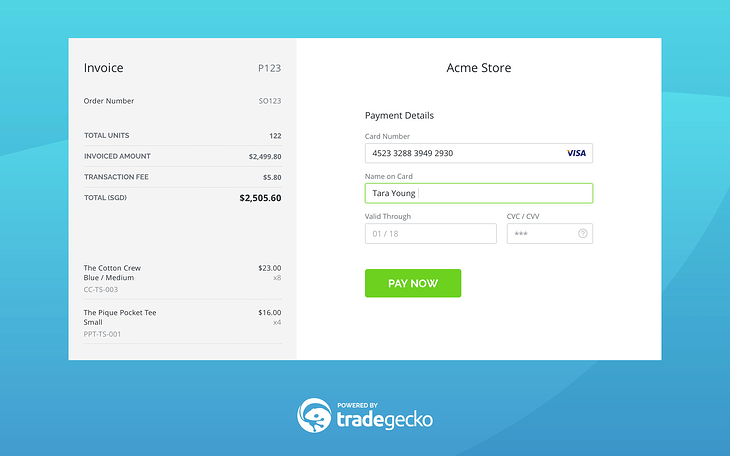 How do I get started with TradeGecko Payments? If you’re already using TradeGecko and have a business registration in the US, UK, Australia, Canada, Singapore, or New Zealand, go to ‘Settings’ and look for ‘Payments’. Are there any prohibited products? If you are uncertain as to whether your business is a Prohibited Business, or have questions about how these requirements apply to you, please contact us. What are TradeGecko’s transaction fees? Where can I get more information about TradeGecko Payments and how it works? Visit our Knowledge Base or reach out to our product experts for more information. How does TradeGecko work with TradeGecko Payments? TradeGecko Payments seamlessly integrates with all sales orders in TradeGecko, including those from the B2B eCommerce store. Customers using the B2B eCommerce store can retrieve the finalized invoices from their Order History and check out immediately. TradeGecko Payments works with all invoices generated in TradeGecko.